The 2016 year saw the most significant reforms of New Zealand’s health and safety systems for 20 years, with the new Health and Safety at Work Act 2015 responding to reports that the country’s health and safety system was failing. This Act led to a great number of new regulations that affected mining and quarrying operations more directly than many other sectors. Despite great improvements in site safety procedures, this has resulted in operators facing higher staffing and training costs than ever before. Mines and quarries can be dangerous places. For anyone holding a certificate of competence, it’s often an overwhelming task to monitor the numerous hazards facing employees on your watch. The contributing factors of these hazards can potentially be mitigated using technology that allows for the remote monitoring of safety-critical features across an entire site. LiDAR (light detection and ranging) systems have long been used in the mining sector to collect topographical data to assist with mine planning tasks. Using the light from a laser, LiDAR scanners can calculate millions of three-dimensional measurements per second, making them invaluable when it comes to providing accurate intelligence across large areas such as a mine or quarry. The data collected during a survey can be used to pinpoint topographical features in both a geographical and situational context to enable planning teams to greater understand the terrain they are working with. Where laser scanning was once used as part of a geotechnical survey, the application of the technology has now reached a point where it can be used to answer specific challenges as part of an operation-wide smart strategy. In previous years, laser-scanning systems were expensive and data took hours of processing to be able to produce a visual interpretation of a target. Advancements in both the hardware and software also now mean that systems are more affordable and results are available in near real-time. It is advancements such as these that are helping LiDAR become the go-to technology for monitoring mines and quarries. Systems such as 3D Laser Mapping’s ‘Sitemonitor Live’ have been designed to monitor structural features of an extractives site to warn of any changes that may indicate a potential hazard. From slopes to stockpiles, LiDAR systems offer the opportunity to automatically collect accurate, quantifiable data without exposing survey teams to additional risks. The speed at which LiDAR surveys can be carried out and processed means that it’s now possible to compare a series of scans automatically and on a regular basis. According to guidance from WorkSafe, bund separations are crucial when it comes to removing the risk of collisions on haul roads. Similar in structure, berms or windrows are subject to strict regulations that stipulate the height and angle of repose needed to prevent truck rollovers. In addition to monitoring safety features, LiDAR can also be used to measure inventories. Using the same interface, stockpiles and tips can be monitored at the same time as structural features to assist in production control, supply chain logistics and business forecasting without having to rely on manual measurements. Stockyards can be fitted with automated scanners that measure at critical intervals. The data is then fed back through the software to compare changes against previous surveys, with the option to visualise data in spreadsheet and visual formats. This level of business intelligence would take hours of fieldwork and number crunching to generate best-guess calculations and although many are now adopting drone or smartphone-based measurement systems, laser scanners collect more measurements in a shorter space of time, meaning that calculations are often more accurate and data sets more complete. Outside of the obvious efficiency benefits, using LiDAR to measure stockpiles also helps operators to ensure that piled materials are stable. Each measurement collected by a laser scanner can be assembled into a three-dimensional visualisation, known as a point cloud. When time-series measurements are compared, a point cloud can show change down to millimetre level. Research has shown that smaller instances of rockfall can be an indication of slope failure so whether this relates to a stockpile or highwall, consistent monitoring is crucial when it comes to protecting workers. 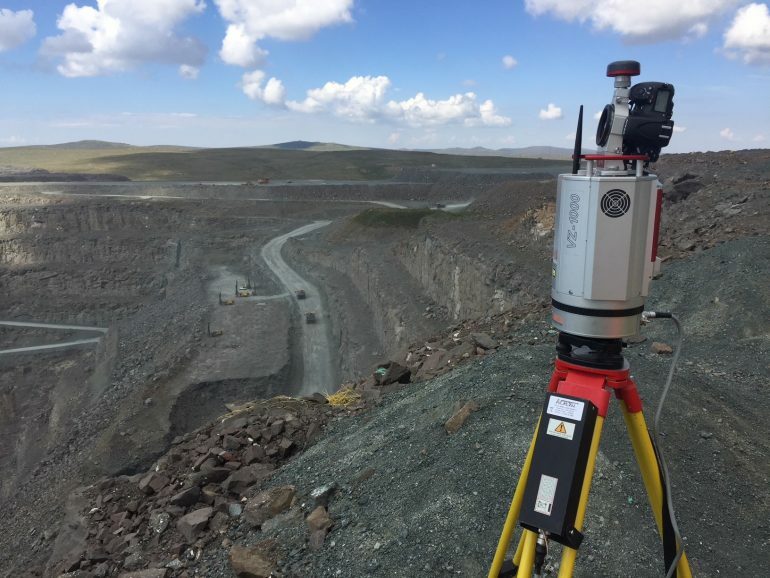 Laser scanning is well used for the purpose of slope stability monitoring in both extractives and environmental settings, yet new software developments have meant that the burden of processing and analysis has now been lifted. Any technology that removes workers from high-risk situations stands to see high levels of adoption in the extractives sector. Remote monitoring systems have come a long way and are now being developed with a bigger picture in mind. Where protocols and regulations stand to slow down productivity, automating surveys using LiDAR not only makes processes safer, but also makes the collected data relevant for numerous uses. In the long run, if used as part of an operation-wide initiative, this new level of business intelligence will save lives and make operations more efficient.